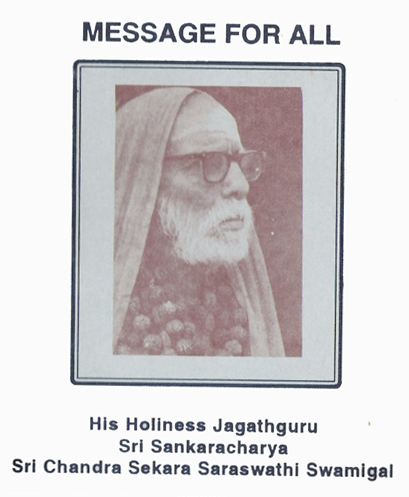 His Holiness Jagadguru Shri Chandrasekharendra Saraswati ascended the famous Kanchi Kamakoti Peetha at Kanchipuram 87 years ago as a young Brahamcharin of 13. The greatness of the Peetha is well known; Sri Adi Sankara, after establishing several Mutts all over India, spent his last years, adorning this Peetha and worshiping Godess Kamakshi. The Acharya, universally known as the Sage of Kanchi, is the 68th in the unbroken succession of the occupants of this Peetha. He has rightly been regarded as an Avatar of Adi Sankara for the great work he has been doing not merely for Sanatanadharma, not only for our country, but for the entire humanity. His gracious eyes are a benediction and his inviting smile which causes a spell of intimacy are unforgetable experiences of everyone who has had the good fortune to have His darshan. we recall, cherish and worship some of the simple sweet words, taken at random from His discourses several years back. This rosary Will bring us peace and happiness. The purpose of prayer is not to petition for benefits. Such petitioning implies either that God does not know what we want, which will militate against His omniscience, or that He waits to be asked and delights in praise, which will degrade Him to the level of ordinary man. Why then do we pray? Though Omniscient God is immanent in every creature and knows what is in the heart of every person, yet, if what we wish to say in prayer remains unsaid, it afflicts our heart and so prayer heals that affliction. By prayer we do not seek to change what God ordains; in fact, we cannot do so. We go to Him to remove our impurities. As Tiruvalluvar said, we attach ourselves to Him, who has no attachments, to rid ourselves of our attachments. A devout consciousness that God exists will itself do the miracle of alchemising us into purity of nature. We obtain a spiritual charge into our frame by being in His presence. Agajaana padmaarkam gajaananam ahamisam Anekadam-tam bhaktaanaam ekdantam upaasmahe. This is a familiar prayer verse addressed to Vinayaka. Agaja is the Divine Mother, Parvathi. As we know, Sri Parvathi is regarded as the daughter of the mountain, Himavan. While even trees, plants and creepers are considered to have motion, because they grow upwards, mountain is static or again,motionless. Being born mountain , Parvathi is Agaja. At the sight of Her beloved child, Vinayaka, Sri Parvathi's face (aananam) beams With joy, even as the lotus face (padma aanana) of Sri Parvathi, Vinayaka is the sun (arka). For His devotees, Vinayaka showers. Benefits generously -bhaktaanaam anekadam. He has only one tusk - eka-dantam. The devotee says that he is worshipping that elephant-faced Vinayaka - Tam- gajaananam upaasmahe - who is the beloved son of Agaja, etc. All troubles in this world start only when attempts are made to wean away people from their native religion and to convert them to a new faith, by holding out the temptation that people can attain salvation only if they embraced that new faith. This is more than what any sensible person can swallow. Since every religion speaks of God, to ask a person to give up the religion in which he is born is tantamount to asking him to give up God and is a sin against God. It is the duty of every person to follow the religion of his ancestors. All of us take care to keep our bodies and our clothes clean. But do we bestow any attention on our inner or mental cleanliness? Inner impurity is the result of desire, anger, and fear. It is common knowledge that when one is in the presence of one’s mother one keeps all evil thoughts under control. Similarly in the presence of the Divine mother we can control our evil thoughts. We can cleanse our hearts only by the Dhyana-thirtha (holy water of meditation) of the Divine Mother. When the heart is so cleansed, It will learn to distinguish the real from the unreal, which will result in the end of births. A day spent without a conscious attempt to clean one's heart, is a day wasted. Impurity of cloth or body will lead to disease which will last only for one life-time. But impurity of heart will lead to diseases which will afflict the soul for several births. Some Western scholars in their ignorance have dubbed Hindu religion as polytheistic. The uniqueness of our religion lies in the fact that under whichever name a devotee worships his Ishtadevata - that manifestation of God which appeals to him most - he considers Him as the all-pervading Paramatma. In fact, the culmination of all conception of the Supreme Being is in Monism. That is Advaita Vedanta, Isvara, Narayana and Parasakti are all different aspects of the one Supreme Being. This is visibly illustrated in the Divine forms of Ardhanaareeswara and Sankara-Narayana. Such manifestations of the Divine are installed in many South Indian temples. Right education should make us know that God is the Truth. Knowledge must fill one with good qualities, through which alone one can realise the Truth, that is God. Therefore, the goal of knowledge is the understanding of the Ultimate Truth. The first fruit of education must be humility and self- control. Education that does not produce these qualities is useless. In ancient days, students went to a guru and requested him to teach them. Now, we have schools for every branch of knowledge, except, perhaps, nadaswaram. According to the ancient system, the pupil must forget his home during the period of his gurukula, and study under the roof of the teacher’s dwelling. He had also to maintain the teacher and himself by obtaining alms (bhiksha) and cooked food. The whole of the food thus obtained was placed before the guru and the pupil can take only what the guru sets apart for him. In this way a guru, who had a number of pupils, was able to secure enough food for the maintenance of himself and his disciples and also to spare to those in need. The salutary effect of begging is that it helps to destroy ahamkaara. Another feature of our ancient education is that if a student misbehaved ­the guru could send him away or subject him to an appropriate act of atonement (praayaschitham). Each one of us know to the full extent the mistakes and sins committed by him or her. But outsiders become aware of only a fraction of these faults and they criticise us for that. We try to hide our faults before others and to show off only our merits. Sometimes we even shed tears over our faults. There is no use of of merely weeping. On the other hand, we should remind ourselves of our faults at the end of each day and pray to God to give us strength to resist evil thoughts and deeds and to help us not to repeat the mistakes we have committed. It is human error to slip from the right path. A man who has swerved from the right path is called Patita and the Tamil expression used in respect of a woman wo has erred is cherukki, meaning, one who has slipped. We must overcome this tendency to slip and rise to the noblest heights of virtue. When adversities overtake us, we blame God and complain that He is blind to our misfortunes. But if we indulge in a little introspection, we will realise that our faults are so enormous that we are utterly unworthy of His grace and, if in spite of that, we are able to get food, shelter and clothing, it is due to the abundant mercy of God. We must consider the difficulties we encounter as a blessing in disguise. A mother may tie the hands of her child who has the propensity to pick up and eat mud. This seeming cruelty of the mother is for the good of the child. Similarly, troubles are verily God's grace to save us. In the entire picture of life, troubles form but a tiny spot. In our ability to visualise in the past and the future, we complain when we suffer in the present. A proper perspective will enable us to understand our present plight in its proper setting. You may have heard of th incident of Saint Manickavachagar making the dumb daughter of the Buddhist ­King of Ceylon respond in verses to his philosophic questions, before Sri Nataraja of Chidambaram. This Saint was able to convince the Buddhist King that the ultimate end was not nirvana or state of nothingness. Sri Manickavachagar illustrated this with the help of vibhuti or sacred ash. When any object is consumed by fire, it becomes charred. If that black residue is burnt again, it becomes white ash. White ash continues to remain white even when burnt again. This shows that white is the ultimate and black is proximate to it. Science tells us that diamond and coal are basically one. White and black are not mentioned in the seven primary colours. So white and black are not colours. The primary colours get separated from the objects to which they are attached when subjected to the test of fire and the objects themselves turn black first and ultimately white. Similarly, in the mental and spiritual plane, the Ultimate Reality is Siva, who is white, and proximate to Him is Parvati who is dark. When we test everything in the fire of jnana, or true knowledge, the residue is white is Siva. Ash in the material plane corresponds to Siva m the spiritual plane. We smear our bodies with the sacred ash to remind ourselves of Siva and the fact that the ultimate goal of life is Siva. Right conduct or seela, which is necessary for the realisation of Siva, has to be acquired through the process of anushtaana, discipline, etc. All these-actions done in a spirit of dedication to God, enable us to keep our hearts clean and single pointed (chitha suthii and ekaagrata). It is only in such a heart that God presents himself. We secure a good reflection only in a clean and steady mirror. Everything must be burnt in the fire of jnana. If we regressively trace the cause of things, we will find that one eternal substance is the sole and universal cause of all the variety and multiplicity of this world. It is to symbolise that Ultimate that we put on tiruman, signifying the earth, that is the source of all animal and vegetable life or vibhuti, the substratum of all material objects. The tiruman worn vertically tells us to strive to reach the heights of spirituality. The vibhuti smeared all over the body reminds us that everything is Siva Mayam. To obtain the grace of God, karmaanushtaana, seela, upaasana and jnana are necessary. We must acquire these means to moksha and foster them in our children. Thus we will obtain the grace of the Supreme Mother and be happy here and hereafter. Doing our appointed task, filled with love, let us burn all our troubles and desires in the fire of jnana and be happy in the consciousness of abiding grace of the Supreme. Before you commence your lessons in the morning each day, you should worship Goddess Saraswati for a few minutes in silent meditation. It is not recitation of prayer verses that matter so much. I may tell you that the essence of prayer lies in sincere devotion to Goddess Saraswati and the Guru (teacher) through silent meditation for a few minutes. This practice will develop in you à spirit of homage and aid you to drive away all evil thoughts from your mind. The puranic stories which teach us right conduct in thought, words and action, are regarded by some as mythology or legends. There is a tendency on the part of some of the people to treat them as imaginary tales. It is human nature to regard a thing which we cannot comprehend as false. Yet, in modern days, people are ready to believe such news items appearing in news papers as the find of leg bones several feet long, or the birth of a child with two heads, or a woman giving birth to a snake. If that were so, why should we disbelieve if a puranic story tells us of a person as tall as a palmyra tree or a man with more than one head? There is need to equip our boys and girls with a certain rudimentary knowledge of Sanskrit and classical Tamil so that they can easily understand when they hear the Ramayana or the Mahabharata recited either in Sanskrit or in Tamil. We regard the cow as a sacred animal. What is the reason? While all human and animal excreta emits bad odour, cow dung alone is free from odour. Not only is it free from odour, it has also the power to remove all bad odour. That is the purpose of sprinkling water mixed with cow-dung around our houses. this testifies to the purity of the animal, and vibhuti made from cow-dung has come to be regarded as sacred. One important difference between other religions and ours is that while other religions speak of a direct relation between man and God, our religions speaks of a mediated relation established through transcendental deities, each presiding over a particular aspect of worldy and spiritual life. Sri Krishna says in the Gita that when Prajapati created men, He did so associating them with the obligation to perform yajnas or sacrifices. The yajnas are our expression of gratitude for benefits Derived. The gods accepted our offerings through the sacrificial fire and blessed us in return with all good things of the world. As an after dinner toast honours even an absent person in whose name it is proposed, the offering made in the fire. in a spirit of sacrifice saying "namama" (not mine), bring gratification to the gods to whom they are intended. The Vedic rituals in a yajna are the process by which whatever is offered with a sense of renunciation is transmitted to the Supreme Being through the proper channel, just as taxes are paid by us to the Central Government, not directly, but through the persons or agencies authorised to collect them. In the present day, social service is viewed in a different manner. Schools and and hospitals are built and banks organised on a community basis with the object of eradicating ignorance, diseases and poverty. But it is evident that these forms of social service have not been an unmixed blessing. Education has not eradicated falsehood and corruption. On the other hand, unsophisticated tribal people whom modern education has not reached are found to be more honest than the so-called educated people. Confidence of obtaining cure in hospitals has made people lead reckless lives. All the banks that have come into existence have not succeeded in eradicating poverty among the masses. In our modern mode of life we have multiplied our wants. This will lead only to perpetual discontent. A life of extreme simplicity alone can bring contentment and happiness to the people. Gratitude for help received is a cardinal virtue. The taxes you pay to the Corporation of Madras and to the Government are your expression of gratitude for the services rendered by those agencies. There are super-human agencies which confer benefits on us. We must express our gratitude to those agencies in the manner prescnbed in the Vedas. This expression of gratitude is known as yagna. The one cure for all human ills is the power to endure them with faith in God's grace. Bhakti alone can give that power of endurance. Temples are the agencies for the cultivation of the bhakti. Hence the obligation to build temples in eyery Place. What is the significance of making offering to the idols installed in temples? This is done as an expression of gratitude to the Power that created all things. Man by himself cannot create even a blade of grass. We will be guilty of gross ingratitude if we do not offer first to God what We eat or wear. Only the best and the choicest should be offered to God. It is not even necessary that every one should worship inside the temples every day. Gopura Darsanam will itself elevate our minds and make us remember the source from which we derive all the earthly benefits. At the same time, it is necessary for the community to see that worship at the temples is conducted properly. We should make it a point to see the temple tower every day and thereby concentrate a while in the contemplation of God. At least once a week we should go round the temple, reciting naamaas (God's name) and doing bhajan. If we do so, we will derive real and lasting benefit. Guru is Isvara in human form, but who is, however free from the triple functions of creation, preservation and destruction, which pertain only to Iswara. If we have absolute faith in him, the guru will shower us with all for which we go to God. In fact,. God is needed only when we cannot find a guru. Guru-bhakti is even higher and more efficactious than Daiva-bhakti. Sri Vedanta Desika has declared that he does not consider God higher than guru. According to a verse, when God is angry, the guru protects you; when the guru himself is angry, there is no protector in the world. If we surrender ourselves absolutely without any reservation to the Guru he will save us from all sorrows and show us the way to salvation. It is due to lack of Guru-bhakti, that Isvarabhakti itself is waning in the hearts of men. We Hindus regard both Siva and Vishnu as the same and this is evident from the fact that in the ecstacy of our devotion, whether we are alone or are in groups, we exclaim "Haro-hara" and "Govinda-Govinda" which names come to our lips spontaneously. The holy days of Sivaratri and Janmahstami, are divided from each other by exactly 180 days, and this seems to indicate that God in His aspect as Siva, protects us during one-half of the year, and in His aspect as Vishnu, in the other half. The traditional practice of boys and girls collecting oil for their vigil on Sivartri and Janmashtami nights, singing in chorus a song which means that Sivaratri and Sri Jayanti are the same, is another pointer to the identity of these two manifestations of the Divine. Life without love is a waste. Everyone of us should cultivate Prema or love towards all beings, man, bird and beast. If we are full of this universal love, we shall feel no sorrow. Children overflow with Prema; but as they grow older, Prema decreases. Prema is exemplifiied in the mother's love for her child. As the saying goes, an unaffectionate son may be seen in this world; but never an unloving mother. Like the mother's attitude towards her child, we too should be prepared to consider the happiness of every creature as of more value than our own happiness. That which has a beginning must have an end, is an inexorable rule. Prema is no exception to this rule and so Prema is not unmixed with sorrow. When a beloved one dies, the survivor suffers grief. On that account is it wrong to cultivate love towards others? No But there is a which does not produce grief in the end. We should seek this Prema that is indestructive namely, Prema to God, who is indestructible. Allthings on earth and in heaven may die out but God is eternal. Everything else springs from Him, lives by Him, and, at death, goes back to Him. Loving God, if we look upon all things as God, we shall have in effect loved them as intensely as we love God. To consider things as God, we should remember that they are alI Isvara-svaroopam, possessing the Chith and the sakti of God, without which none of them can exist or function. A non-luminous skylight illumines a dark room when the sunlight falls on it. So too do all objects of the world obtain their intelligence and power from the Omniscient and Omnipresent God. If we love everyone and everything around us as God, even if they disappear, we will not be afflicted by grief, because our love of God will continue to remain. It can be pointed out to the credit of Hinduism that orthodox Hindus are vegetarians. Orthodox widows of Bengal are strict vegetarians, though Bengalis as a class eat fish. These widows do not drink even a drop of water on Ekadasi day. In the South, many people among non-Brahmins have adopted Saiva (vegetarian) food and on certain sacred days non-vegetarian food is taboo for the generality of non-Brahmins. The objection to meat is himsa to animals. By the same token, cutting of vegetables too is himsa, By cooking grain, you scorch the garbha (seed) within it and that too is himsa. It has been laid down that ripe fruits and leaves which fall off plants and trees will have to be eaten if one does dot wish to injure any living being. The Rishis of olden days took only such food and cow's milk after the calf had its fill. If one lives on this kind of food, one will be free from kaama (lust) and freedom from lust is a more potent means for family planning than the methods recommended in modern days. Deepawali and Naraka-Chaturdasi are one and the same. This is celebrated as a national festival throughout India, but in different ways in different parts of the country. In North India, it is considered a day of lights and the houses are colourfully illumined on the occasion. In the South, however, people take an oil bath before dawn and put on new clothes. It brings happiness and joy to people who undergo sufferings in their daily lives. In the early hours of the dawn of the day preceding the new moon day, i.e. Chaturdasi, when the sun is in the Tula Rasi (Libra) of Zodiac, water anywhere in the world is Ganga and oil becomes saturated with auspicious presence of Sri Mahalakshmi. Everyone from the simplest gypsy to the proudest magnate, from the innocent child to the serene saint should take a bath with oil and water and be happy, illuminating every nook and corner with strings of light, literally deepa-aavali. This is the boon prayed for by a mother when her son, who was a real naraka, to the world at large, was being killed by Sri Krishna. "Let the happiness of every creature in the world be the compensatian for the grief caused to me by the death of my son", was the prayer of that bereaved mother. Deepavali outweighs every festival because of its having emanated from two hearts in which hapiness of the world at large outweighed the lightest pitch of personal calamity. Nothing can be nobler than this last wish of the dying demon, and more so, the prayer of a bereaved mother. As our earthly parents attend to our material needs, the divine Parents, Sri Parvati and Sri Parameswara, attend to our spiritual growth. As vaak and artha (word and its meaning) are inseparable associated together, so too are Parvati and Parameswara, in the manifestation as Umamaheswara. Kaama or desire is the cause of birth and Sri Parameswara destroyed Kaama with the flame emanating from his third eye. Kaala is the cause of death and Parameswara kicked and vanquished Kaala. In the glorious form of Ummamaheswara, the third eye which burnt Kaama is common both to Parvati and Parameswara. The left leg which kicked Kaala is that of Parvati. This is why by surrendering our serves to Parvatee­-Parameswara in single minded devotion, we can get rid of birth and death and attain eternal bliss. Bhajana groups or separate organisations formed for the specific purposes, can minister to the religious needs of prisoners in Jails and patients in hospitals. Permission has now been accorded for conducting religious classes inside jails by Hindus, Muslims and Christians. Hindus are not taking advantage of this concession, while others are. Steps must be taken to remedy this defect. Distribution of booklets and Pamphlets containing the life and teachings of pious men or religious stones, the organisation of kalakshepams and the holding of discourses, can be undertaken for the benefit of the prisoners. If we are able to reform even one in a hundred by this means, it will be a great achievement for society. It will also create a healthy feeling in the prisoners that society has not neglected them. For the benefit of patients who are obliged to remain in hospitals for long periods, voluntary organisations can arrange weekly poojas in some reputed temple and distribute the prasadam from this temple among the patients. They can also be give specially written pamphlets or booklets calculated to promote faith and devotion in their hearts. These patients, even if they eventually succumb to their ailments, will die with the name of God on their lips. The function of a Prabhu or Lord is both protection and punishment. Siva saved the world from disaster by swallowing the poison generated when the Occean of Milk was churned. In other words, He took upon himself the sins of the world in order to save humanity. It is this function of God which Christian attribute to Christ namely, saving the sinner. Lord Siva Punished cupid(Kaama) when the latter disturbed. His penance ; but restored him to life, though without from, at the entreaty of Rati and the intervention of Parvati. Sri Parvati as Sri Kamakshi or Sri Sivakamasundari is depicted as holding the bow and the arrows of Kamadeva controlling Kaama within Her eyes. Hence Kamakshi. She holds the sweet sugarcane bow representing the minds of human beings, and the five arrows representing five senses through which the mind is influenced and is functioning and won the grace of Lord Siva, who alone, as the destroyer of Kaama and Kaala, is capable of saving us from the cycle of birth and death. If we surrender ourselves at the feet of the Divine Mother in the manner in which Sri Adi Sankara has taught us In the Soundarya Lahari, She Will help us to keep the mind and the senses under control and purify our heart, so that we may attain perfection Without being afflicted by kamma and lobha (lust and desires) and realise the Ultimate Truth and achieve sublime peace and happiness. We can move fast only when we sail with the wind. The Sandhya kaala is the time when the Cosmos is ripe to respond to correct vibrations emanating from us. Is it proper ­on our part to waste such a opitious time either in eating houses or in clubs Majority of those belonging to the new religion observe prayers at the prescribed hours. But we who belong to this ancient religion have neglected our duty. Therefore, at the approach of Sandhya, wherever we may be, we must wash our hands and feet, wear vibhuti, perfom our anushtaana, and spend a little time in praying to isvara. It is being argued in some quarters as to why we should continue to hug these ancient ways when science has advanced so much as to enable man to create even artifical satellites and to make them go round the earth. But such people ignore the fact that all these material advancements are of no avail, when there is no peace within oneself. What is the use of the entire world to a man, if in the process of acquiring it, he loses his soul? It is also worth rememberiing that the country which has created the Sputnik is also getting the Mahabharata translated and that this great Indian epic is being taught in their schools, even though religion is not. It will not be a surprise if the Russians begin to treasure the Mahabharata with great enthusiasm. The Vedic religion commands the allegiance of millions of people, in spite of the absence of propaganda or missionary institutions to propagate it. It is the example of great men who lived that religion that sustains the faith of the people. Good men, who had attained a high level of jnana, won universal respect, irrespective of the caste in which they were born.. Godliness and love for all are the qualities by which the greatness of a person is judged So long as such great men continue to illumine the dark corners of human heart, the Vedic religion will wield its influence, not only in this country, but outside it also. It is only when we regularly and faithfully practise the anushtaanaas enjoined upon us, that society can produce outstanding persons, who will be beacon light of Vedic religion to guide the multitude along right lines. If each of us perform the anushtaana prescribed for him, the cumulative effect of the anushtaanas of all will be the welfare of Society. One does one's religious duty in the interest of all. In order that each may do his part well different duties have been prescribed for different persons. The anushtaanaas prescribed for one is neither superior to, nor inferior than that prescribed for another. On the other hand, one who is enjoined to do bhajan only, may reach the ultimate goal earlier than another who has to perform elaborate rituals. Therefore, mutual respect and mutual love should prevail in society. Each person should do the anushtaana prescribed for him, respecting and cooperating with the others, so that the collective efforts of all may result in the welfare of society as a whole. The man doing devoutly the anushtaana prescribed for him, is the true soldier of Vedic religion. Uma, the Divine Mother, is the personification of Pranava (Om). She is brightness in light and fragrance in flowers. She has the illumination of a thousand suns and yet has the Soothing coolness of a thousand moons. Along.with Isvara She is the Paramatma-swaroopa sung by the Vedas. The meaning of the stanza is that when the Paramapursha, proclaimed by Veda, was born as the son of Dasaratha, Veda also made its appearance in the form of Ramayana, produced by the son of Prachetas i.e. Valmiki. The Vedas are source of all dharmas. Vedokhilo dharma moolarn. Sri Rama was the upholder and embodiment of dharma as indicated in the verse, Ramo vigrahavaan dharmah. He protected dharma by his mental courage and disciplined life. Therefore, when he left for the forest for fourteen years to honour the pledge given by his father to Kaikeyi, his mother, Kausalya, offered him as a talisman, the very dharma which he protected, so that that dharma may in turn protect him from all harms. The Ramayana teaches us the essential principles of the Vedas. Any superior scripture is generally called Veda and no wonder the Ramayana has come to be revered as Veda. The Parama-purusha spoken of in the Vedas is poorna, the perfect and full embodiment of dharma, and so is Sri Rama of the Ramayaana. The Ramayana instructs us in karma, bhakti, and jnana, and in the dharmic way of life. If we keep before ourselves the ideal of Sri Rama, we will be able to tide over every difficulty and danger and will be saved from straying into evil path. Sri Rama naama smarana is the sure succour in life's tribulations. Anjaneya who practised the japa of this taaraka mantra to perfection, is the embodiment of brahmacharya and valour, which are the most needed to endow us with strength to successfully go through the voyage of life. If we are anchored in Sri Rama and His supreme devotee, Sri Anjaneya, our mind will not be sullied by kaama or other passions, but will be disciplined to attain the Reality pointed out by the Vedas. All dharmas depend on women for their maintenance streemoolah sarva dharmah. It is sad to see girls nowadays remaining unmarried till a late age, due to the indigency of their parents, to the exorbitant demands of dowry, or due to the inability to get proper bridegrooms. The Parsi community has an organisation to help the less rich among the commumty. It is desireable to organise a Bank to aid the marriage of unmarried girls belonging to poor families, who have attamed puberty, but whom their parents are obliged to keep at home, because of their sheer inability to give them away in marriage. It is also necessary to perform all marriages as economically as possible, without, however, omittting the prescribed religious rites. It should be our endeavour to avoid wasteful expenditure in marriages as well as in other ceremonial occasions. The Brahmin community has forgotten its tradition of plain Iiving and high thinking and taken to expensive ways of living. Time was in our land, when Brahmins lived the same simple and unsostentatius lives as other communities. This ancient identify of life of different communities is exemplified in some of the expressions we still use. The cooking pot in our house is called Vengala paanai, and the diamond ear-rings, which rich women wear, are called varia olai. The words, paanai and olai underline this affinity among all communities. We should avoid the costly new fangled habits, wear only simple apparel, and live frugal lives. The dancing Nataraja and the reclining Rangaraja are but dual expressions of the one Supreme. Different schools of philosophy have come into existence to satisfy the needs of varying human temperaments, tastes and aspirations and any path, if consistently pursued, will lead to the same goal. In most of our temples, the principal deity is installed to face east, though in a few temples we have the deity facing west also. In the latter case, the principal gopuram (tower) will be on the eastern side. But in Chidambaram and Srirangam, the deities face south, as if proclaiming to the devotees that they are there to protect them from the threat coming from the south, namely, mortality, as the God of Death, Yama, hails from that direction. As Lords of the entire created world, both are called "Raja", and each holds His court in a ranga (stage), the Lord of Chidambaram dancing in joy with uplifted leg and the Lord of Srirangam stretching himself at ease in the repose of yoga nidra. Dakshinamurti, another aspect of Siva, is also found facing south. Nataraja stands for aananda (bliss), which expresses itself in the dynamic rhythm of ecstatic dance. If an English-educated youth belonging to our religion is asked what his religion is, he would reply that he professes the ‘Hindu’ religion. Go to a village and ask a peasant what his religion is. He will not be able to give a name to his religion. The name 'Hinduism' which is used now to denote our religion was unknown to our ancestors and is also unknown to the common man among us. We have no evidence as to when our religion began. Obviously, it did not ‘begin’ at a particular time. It must be said to be beginningless. It has been existing always. It is Sanaatana. The nearest Sanskrit word for religion is dharma, though dharma signifies much more than religion. Our religion, cannot be named after a founder; for there was no founder for it. So, if at all it is necessary to give a name to our religion it can only be called Sanaatana dharma or the eternal religion. We said that the Vedic religion was the earliest religion of mankind. All other religions arose only after lit. There are evidences to conclude that it was prevalent all over the globe. We shal mention a few of them. In the island of Madagascar off the eastern coast of South Africa, most of the place names have affinities with that of Rama. In far off Mexico, they celebrate a festival caled Rama sita. The time of the festival corresponds to our Dussara or Navaraatri period. Excavations made in that country have brought to light a number of Ganesa idols. The ancient inhabitants of those parts were Aastikas, (i.e. those who believed in the Vedas), a term which still lingers in its corruption as Aztecs, as the people there are now called. In the Eastern Archipelago, evidences of our religion are to be found. In Java, there are numerous relics of Hindu cult and worship. All these evidences serve to show that our religion was once prevalent throughout the globe. It may have been that for causes which we are not able to ascertain, the tenets and practices of our religion began to decline in other parts and their prevalence came to be confined to the land of their origin originally known as Bhaarata Varsha, India. When it lapsed into oblivion In other countries, and when due to lack of any religious consciousness, the people became godless and unethical, there arose in those lands great prophets who brought to light one aspect or another of this forgotten religion. They declared themselves to be founders of new religions and came to be revered as such. But it must be noted that the fundamental moral principles underlying these new religions only emphasised some feature or other of the universal Vedic religion with certain theological variations. The enactments of legislatures regulate public conduct. But what about the individual morality? What is the criterion of personal action, of what a man should do by himself and for himself? In our religion it has been declared that in matters of conduct one should be guided by the ordinances of the Vedas. ‘Vedokhilodharma moolam’: the Veda is the source of all Dharmas. The vedas are authorless, apaurusheya; they are not manmade. They are intuitions of Yogic sages into eternal Truths. Suppose a situation arises in which no guidance can be obtained from the Vedas. Many of the Vedas have been lost. If the exact Vedic texts cannot guide us in our conduct it is prescribed that we should look for guidance to the writings of sags like Manu, Yaajnavalkya, Paraasara and others who have left behind what may be called aides memorie o smritis which should determine our conduct. There is a mistaken belief that the authors of these Smritis were lawgivers. That is wrong. They did not enunciate new laws. Smriti implies what is remembered. Smriti is a record of the memory of the sages of the Vedic texts including what might have been lost in the passage of time. Smritis follows and is in accord with Srutti or the Vedas. Kaalidaasa pricturesequely conveyed this when he said that the queen Sudakshina followed her husband, King Dileepa, and walked a llittle distance behind him as he took the cow Nandini to graze in the forest, with accordant mind even as the Smriti follows the footsteps of Sruti. It will be clear that the appeal to conscience or the inner voice must be made only when all the other forms of guidance that have been enumerated, namely, Sruti, Smriti, the way of life of those well-versed in Smriti and the example of good men are not available. Then and only then, can we act as our conscience bids us to act. Now-a-days however the fashion is to make it all topsy-turvy, to give the first place to what is called one's conscience relegating all the other prescribed guidances to a secondary place, or, as it often done, to condemn them as meaningless and irrational. The ancient view, however, about the pramaanas, or criteria of dharma has stood the test of time. In order, therefere, to know what may be done and what may not be done, we must be guided by the pronouncements of the Vedas which state prescriptions Vidhis and prohibitions Nishedas. Sri Krishna said in the Gita: "He who, having cast aside the injunctions of the saastras acts according to his own sweet will attains not perfection, or happiness or the highest goal". Therefore, says Sri Krishna, "Let the saastra be our authority in determining what ought to be done and what ought not to be done. Knowing what has been prescribed in the shaastra, you should perform your action here". "There may be other poets, O Lord: who can compose verses in Thy name very quickly. I am a slow poet. But my good fortune is greater than theirs. For, while I struggle to versify my mind lingers for a longer time on the features of Thy resplendent Person". God may be the creator of the world and also the dispenser of the fruits of our actions. But why should we have devotion to Him? Why should we show bhakti to Him? The answer to this question is provided in the Yoga Sutras of Patanjali. Yoga is defined as 'Chittavrttinirodha'. It is the control of the mind's activity. But how to control the mind? This can be brought about by worship of God. The world is full of things which distract the mind, which make it shake and waver. To keep our body in balance without being tossed about we hold fast to a strong pillar. Even so, to keep our mind steady, we should make it stick to something unchanging and unshakable It must be something that is fixed, sthaanu, unmoving and permanent among the unstable things of the world. God who is the all knowing Intelligence is the One Permanent in this world of impermanent things. We should hold Him before our mind to control it and steady it like a flame in à place where there is no breeze. What really is the core of bhakti? It is the condition of mind which is continously drawn to and anchored in the feet of the Lord of all creatures, the Pasupati. Sri Sankara has a verse which brings out the nature of bhakti by a few beautiful examples from Nature and human relations. ‘Ankolam nijabeejasantath' It is traditionally believed that there is a tree called the ankola tree. Its seeds fall down from the full-grown tree. By some internal compulsion of its nature, it moves of its own accord towards the foot of the parent tree. Having reached it, it gently ascends clinging to the trunk and enventually becomes one with it. 'Ayaskaantopalom soochikaa'. The needle is drawn to the lodestone, gets magnetised by it and becomes itself a magnet. 'Saadhvee naijavibhum'. A pativartaa woman intensely longing with all here heart and soul for the company of her lard who is all the world to her. 'Lata kshitiruham'. A creeper meandering on the ground is on the look out for a tree to twine itself round. Having found it, it envelops it on all sides and cannot be separated from it even with great force. 'Sindhussaridvallabhuam'. The rivers which take rise in distant mountains rush forth with turbulent avidity to flow into the sea. The rivers become one, with the waters of the sea and their water also becomes salty even as the sea water. The attraction in all these cases is natural and spontaneous, not a calculated or artifical one. At the start they, feel separated from that to which each of them is attracted. But they cannnot subsist in their separation. The seed, the needle, the saadhvee, the creeper and the rivers find the fulfilment of their being in the union and eventually, in their identity with that which alone makes for their completion. To the saadhvee i.e. the pativrata, the true wife, her husband is her all. He is her very life. Separation from him even for a second causes her intense anguish. The rivers rise on mountain tops, where clouds pour out what they took out from the sea, their original source and the ultimate goal. They flow in torrents and fall ill cascades, roaring with fury betraying their eagerness to meet their lord, the saridvallabha and then they merge in its bosom. The true devotee prays to God to give Himself to himself. "Give me my own nature" 'madeeyam eva svaroopam dehi' In the last analysis, since each man's true nature is God Himself, 'Give me to myself means 'give Thyself to me'. This truth is wonderfully brought out in another prayer that Sri Sankara sang in his saundaryalahri. The prayer starts with the words. 'Bhavanit twam daase mayi vitara drshtim Sakarunaam' . Here 'Bhavaani' is the vocative case; it apostrophises the Supreme Mother With one of Her names. 'Twam' means Thou and in the sentence functions as the grammatical subject of what is to follow. But, 'Bhavaani' is also a verb in the first person singular future tense which means 'may I become' and tvam means ‘Thou’. The first two words of the prayer can also mean 'May I beome Thou'. Sri Sankara says that as soon as the Supreme Mother hears these first two words of Her devotee's prayar, with out waiting for what was to follow she immediately (tadaiva) bestows on him identify with Herself nijasaayujyapadaveem. But why do people wrangle saying that one deity is superior to the rest, that the deity whom they worship alone is the highest? A bridge across a river has a number of arches To a man standing under one arch, all other arches will appear smaller than the one he stands under. This arch will appear biggest to his eyes. Even so, to a votary of a particular deity, all other deities will appear inferior. But the truth is that deities are manifetsations of the One God. All arches are similarly constructed and have the same dimension. It is good to remember two devotional hymns, one in praise of Vishnu and the other in praise of Siva sung by devotees of the different persuations. They are the Tiruppavai of Aandaal and the Tiruvembaavai of Maanickavachakar. Both of them deal with awakening the sleeping devotees of God from their slumber before dawn. The lanugage and the substance of the two hymns show a remarkable similarity bringing forcibly to our minds that, in the ultimate analysis, from the point of the devotee and his devotion there need be no difference in respect of Siva or Vishnu. A devotee of one manifestation is a devotee of every other manifestation. That is the way to establish devotional harmony. All the theistic schools of our religion have stemmed from the Vedic religion which proclaimed: 'That which exists is One; the sages speak of it variously'. The substance is ultimately one; its shape and name may be as various as you please. In the matter of the form that one chooses for one's worship, one goes by the practice in vogue, the sampradaaya in one's family. There is no need to give up one form of worhip and adopte another. Similarly one need not give up the religion in which one is born and adopt another. The apachaara or sin in conversion is not so much in going to a new religions as in giving up the old religion in which one was born. The convert to another religion scorns at the God whom he was worshipping the previous day. On should observe the traditional practices in religion; else, he is a fallen man. Invitation to a new religion implies that all who lived before the birth of that religion did not attain salvation and also that salvation is denied to all those who do not belong to that religion. Obviously this is absurd. Even to ask à Saivite to turn a Vaishnavite or vice versa is also wrong. To ask a man to give up his old religion is, in fact, to ask him to give up the God whom he worshipped. It is a sin against God. God accept all forms of worship, even the unsophisticated forms (avidhipoorvakam). He ultimately turns the devotee to the high and holy path and takes Him to Himself. For, the God of all religions and of all religions-denominations is the same. Still another institution of our religion is marked by the numerous kshetras and teerthas that abound in our land from the Himalayas to Kanyakumari. In fact, the ocean that engirths our country on three sides is itself looked upon as a punyateertha, holy waters. Some of the cities are called salvation spots or mokshapuris. We speak of sacred rivérs and tanks. What is their significance? How did these spots become sacred? In the past yugas people acquired spiritual merit by performing tapas, intense austerities through a number of years. With the lapse of time, men's capacity for endurance and strength of will deteriorated. Our ancient sages were full of compassion for future generations. So they themslves performed tapes, those holy personages dedicated them to those sacred spots saying that whosoever came to that kshetra or teertha would have the benefit of their tapas and would be purified and elevated thereby. That is how the custom of pilgrimage to holy places arose in our country and serves as a spiritual bound unifying all people of our motherland from one end of the country to another erasing all differences of caste, language customs and manners. Every object in the world, animate or inanimate is a manifestation of the One God. If one realises this truth one will do nothing evil. One will not feel anger or disgust or hatred for any thing or person. The realisation and experiencing of this fundamental truth is the true goal of life. He should begin by seeking to see God at least in one object through concentration upon that particular object as God-which is one hundred percent true by itself. The grace of God resulting from such intense concentration will enable him to go further and see God manifest in all that is and thereupon he will be free from the limitations arising from non-experiencing of the truth that God is in all things. This is the fundamental basis of Moorti upaasana (sagunopaasana). This upaasana unfortunately is nowadays derided as "Idol-worship". It is a misnomer to regard Moorti upaasana as idol worship. The true worshipper of a Moorti never feels that he is worshipping a stone or a piece of metal. He thinks only of God-forgetting all else. Saint Jayadeva of Bengal was the pioneer of the Bhajan school. It is said that while Jayadeva sang his heart-melting songs in praise of the Lord, his wife, Padmavati, danced and Lord Krishna, appearing in the form of a child, directed the steps of dancing Padmavati-Hence, Jayadeva addressed Sri Krishna as "Padmavatee - charana - chaarana­-chakravarihi". The path blazed by Jayadeva was followed by Krishna-Chaitanya, Tukaram, Meera Bai and others in North india. Correspondingly there lived in South India, Purandaradasa, Bhodendra, Ayyaval, Sadguru Swami and. Others. Purandaradasa proclaimed to the world, Ninna naama ondu iddare saaku, "Your name is enough for me'. Bhodendra has written a number of works stressing the efficacy of naama japa. Even today, at the commencement of a bhajana or a kalakshepam, the blessing of Bhodendra, Ayyaval and Sadguru Swami are invoked. Great Saivite saints, who have sung the praise of Siva naama, also graced South India.